I'm not a guy who gravitates toward Weetabix or Weet-Bix type cereals. I usually find them bland and boring compared to sweeter All-American wheat biscuit cereals like Frosted Mini-Wheats or Raisin Squares (1982). But I have to admit, new Chocolate Crisp Minibix just made a Weetabix fan out of me. Chocolate Crisp is a perfect name for this cereal. It's crispy (at first) and chocolaty. Dark chocolate chips is listed 3rd in the ingredients list. That equates to three or four tiny pieces of chocolate in each bite-sized wheat biscuit cereal piece. The chocolate pieces aren't as visually noticeable in the actual pieces as they are on the box, but the flavor is definitely noticeable. After eating many cereals that are "chocolate flavored," it was refreshing - even exciting - to bite into a spoonful of this cereal and taste actual chocolate. A word of warning to lovers of crunchy cereals: Chocolate Crisp Minibix is a crunchy cereal... for about four minutes. Once the pieces are swimming in milk they soften quickly. I'd recommend eating this cereal in two 1/2 cup portions as opposed to a single 1 cup serving. If you like snacking on dry cereal, you should give this product a try. It will remind you of little, crunchy chocolate chip cookies. If you've never tried Weetabix or Weet-Bix type cereals, this is a great cereal to ease you into some new options for breakfast. Nutritional considerations: Each 1 cup serving of this cereal has 200 calories, 3 grams totals fat, 1.5 grams saturated fat, 0 grams trans fat, 0 mg cholesterol, 5 grams dietary fiber, 14 grams sugars and 5 grams protein. This cereal also provides 37 grams of whole grains and 40% daily recommended iron per serving. 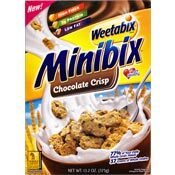 What do you think of Minibix Chocolate Crisp Cereal? I was notified by Weetabix that this product was discontinued due to low sales and production issues... let's lobby to bring it back!! 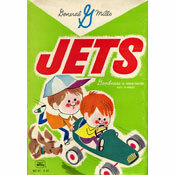 I can't find this cereal anywhere! If any of you know where-to-purchase, PLEASE add info for those of us who LOVE it! Thanks! so much. I seem to also have bought out my local Safeway store. Have they discontinued this item?? I seem to have bought out all of the chocolate crisp in the area and the stores haven't carried it since I bought them all. I love all Weetabix cereals especially the organic biscuits, but never tried this one! Thanks for the review Weetabix is one of my favorite cereals after Peanut Butter Puffins!